Call Center quality monitoring can be far more than transaction monitoring. In every area of business, results are the true measuring stick of success. It’s no different in your call center. But before you can achieve quality results, you must take the time to perform an internal audit of your call center. Start by reviewing your call center’s strengths and weaknesses. Consider the team. Consider the processes. Consider the technology. Dive into the analytics. They’re more than numbers. They reveal a story about where your business is today and where it’s headed. Only then will you have a crystal clear picture of your call center. Unfortunately, not every call center is getting the results they aim to achieve. In fact, here are the 4 most common barriers to a winning call center program. You’ve heard the saying, “Garbage in, garbage out.” If you don’t have the consistent data, you can’t read the analytics. Therefore, you can’t take action because you don’t know what action to take. In auditing numerous call centers, we see this problem arise across many industries. They’re simply working with inconsistent volume and data. There are multiple reasons why this occurs. First, the QA staff is often given other tasks: Pulled onto the phones, training or even re-assigned to put out other fires. Second, the team is often understaffed. And third, there simply isn’t a priority given towards completing quality evaluations. The results: This lack of consistency directly impacts the number of call center quality evaluations for a given month. Your data is incomplete which means your statistics and analytics are fuzzy and not clear. As a result, you can’t clearly track your training or trends. You have no clue if your ROI from your quality program is weak, strong or in-between. You’re essentially flying blind. We’re not talking about simply box checking quality evaluations. Quality Analysis goes far beyond that action. First, it starts with reading the tealeaves. Take a close look at what the analytics reveal. Really dig deep to understand what exactly is occurring in your business and in your industry. Review the trends, the root causes and the recommendations. Next, you should audit your call center and the team that brings it to life. 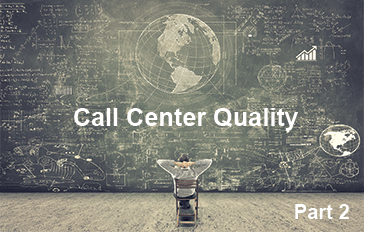 Perform a quality analysis at the individual, group and center levels of your contact center. Once you get serious about performing a quality analysis across the entire spectrum of your call center, you’ll uncover a roadmap that points you to the results you seek. Your call center analytics are so important because they help you to discover critical trends. Which way are sales trending? Is your customer service getting better or worse? Without a consistent volume of quality data, you’ll simply be in the dark. Could you imagine wasting a year or more and not knowing which way your business, sales and service are trending? Unfortunately, it’s a problem we see all too often. But the second you have consistent and quality data to work with, you’ll have a crystal clear picture that reveals the service and sales trends. In fact, if you properly align your quality criteria, the trending results will surprise you. Because you should have a near match with certain aspects of your CSAT data as it relates to service quality of interaction with your representatives. If analytics are the gasoline to fuel your business, action is the 500-horsepower engine. Without engaging the engine of action, nothing happens. Unfortunately, we come across this indecision and inaction in multiple industries. They have the data. They have the analytics. They even have the clear trends, whether good or bad. Then they sit, unsure of what decisions and actions to take to improve their sales, service and ultimately their business. We have ample experience in suggesting and implementing the right decisions and actions for our clients. Then, we go one step further and track the effectiveness of the actions. Through quality empirical evidence, we prove beyond doubt that the right action drives results. Here’s an example: Let’s assume that handling current marketing promotions and customer inquiries about a new product launch has been trending down for 3 months now. Without any action, this negative trend will continue. Sales will suffer. Customer service will erode. It could seriously derail the business. Here’s a rewarding action: The data and analytics clearly support quick training modification to cover elements missed in the initial product rollout. Plus, they should be specifically targeting customer-reported issues identified by the call center quality program. Once training has been completed, you should review the trend every month to ensure it’s moving in the right direction. Action is critical for results. We’ve spent a number of years working directly with companies to help them take the right action based on the data and recommendations presented to them. To use an analogy, pilots will often take action to avoid a dangerous thunderstorm ahead of them. The passengers appreciate it because they avoid severe turbulence. However, we’ve also seen where call centers take action — they try to avoid that thunderstorm — but it turns out to be the WRONG action. They actually hurt their sales, service and/or business. This is actually a pretty common problem. If that sounds like you or your call center, we will address this problem in our next blog post titled “Why Your Call Center Quality Program Isn’t Delivering The Results You Want (And How to Fix It)”.